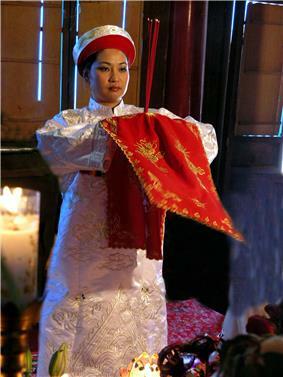 A Lên đồng practitioner performs in a pagoda. The term Đạo Mẫu (Han Nom:道母) refers to the worship of mother goddesses in Vietnam. While scholars like Ngô Đức Thịnh propose that it represents a systematic mother goddess cult, the term draws together fairly disparate beliefs and practices. These include the worship of goddesses such as Thiên Y A Na, The Lady of the Realm (Bà Chúa Xứ), The Lady of the Storehouse (Bà Chúa Kho) and Princess Liễu Hạnh, legendary figures like Âu Cơ, the Trung Sisters (Hai Bà Trưng), and Lady Trieu (Bà Triệu), as well as the cult of the Four Palaces. Đạo Mẫu is commonly associated with spirit mediumship rituals—known in Vietnam as lên đồng—much as practiced in other parts of Asia, such as Taiwan, Singapore and Hong Kong. Although the Communist government had initially proscribed the practice of such rituals, deeming them to be superstitions, they relented in 1987, once again legalizing their practice. ^ Asian Ethnology, Volumes 67-68 2008 p.305 "mother goddess religion (Đạo Mẫu)"
^ "The Mother Goddess Religion: Its History, Pantheon, and Practices," in Possessed by the Spirits: Mediumship in Contemporary Vietnamese Communities, ed. Karen Fjelstad and Nguyen Thi Hien. (Ithaca, N.Y.: Cornell Southeast Asia Program, 2006), 19-30. ^ Nguyen Quoc Tan, Mother Goddess Liễu Hạnh under the View of Religious Studies, Religious Studies Review Vol. 1, No. 2 – May 2007 .